Usually 9th ave is out-of-bounds from an ML perspective, and the opening of a new Thai restaurant in this area of town is hardly sensational – in fact, there’s no less than 15 Thai restaurants within a 4 block radius of the newly opened Pure Thai Shophouse. But after reading Grub Street’s opening report, and learning of the pedigree of Chef David Bank, who previously worked under Jean-Georges Vongerichten at the Mercer Kitchen, I decided that this would require an out-of-bounds journey. And boy am I glad I made that trip. A meander down 9th ave in search of Thai sustenance can be overwhelming. One Thai restaurant might cater to customers who prefer to dine amongst garish bubblegum pink décor, while the next Thai venue offers an exclusive ‘secret’ menu to the knowledgeable few with an old copy of the Zagat guide or access to Yelp.com. All serve the same highly fungible crowd pleasing dishes of pad thai, drunken noodles, and curries in various earth toned colors. However, if you’re ever in doubt as to which Hells Kitchen Thai joint to pick for lunch, I’ll suggest that Pure Thai Shophouse is perhaps the only Thai restaurant worth visiting on 9th ave. The restaurant coyly purports itself to be humble street food – the walls are lined with rustic but handsome wood planks, and the tables are similarly austere. Diners squat on practical plastic stools and absorb a background soundtrack of Thai pop music and an atmosphere so unpretentious it wavers on avant-garde. Pure Thai’s prices overall are a buck or two lower than their competitors in the neighborhood, though the portions are restrained – think of it as motivation to compose your lunch with multiple items from the menu. Given the portions and prices, you can eat very well and remain under the $10 mark. I kicked off my lunch with an order of chicken satay ($2.50) from the “Snacks” menu, which came as a duo of diminutive but tender, smoky, earthy chicken. The dish also comes with a dainty bowl of nam chim taeng kwa (cucumber relish), which provides a sweet and sour counterpoint to the chicken. Another appetizer of chicken curry puffs ($2.50) was perhaps the least successful dish of the meal. More bready than flaky, more flat than flavorful, the clunky puffs needed a good dab of sambal oelek and a generous drag through the accompanying cucumber relish. 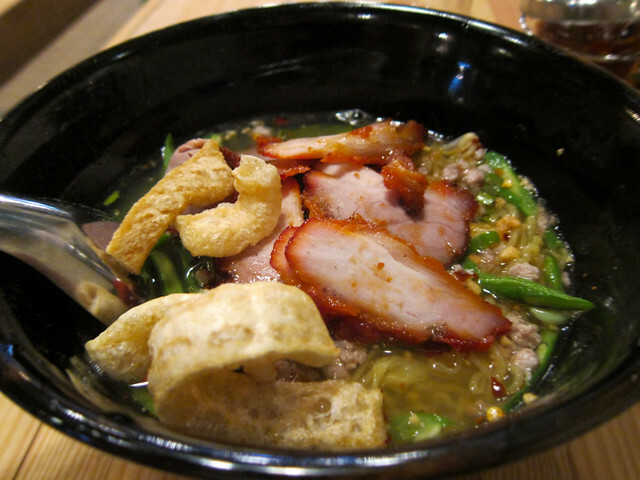 The “Pure Thai Noodle” menu is the thing to try if you dine here. These dishes stray from the popular Thai noodle combinations (pad thai, et al) and are more representative of the Chef’s fine dining pedigree. Tender, ethereal ribbons of handmade egg noodles make their way into assertively flavored pork broth in a bowl of Sukhothai pork noodle soup ($6). Sweet slices of roasted pork are nestled amongst crunchy long beans and crumbles of ground pork. And if it couldn’t get any better or porkier, the dish is lavishly topped with crispy pork cracklings. Despite the dizzying amount of complex flavors and textures, the dish is remarkably clean on the palate – It’s a nearly flawless bowl of noodle soup. The Nakorn Sawan ($6) is definitely not your average bowl of chicken noodle soup. The broth is soy based, and subtlety flavored with Chinese 5 spice. 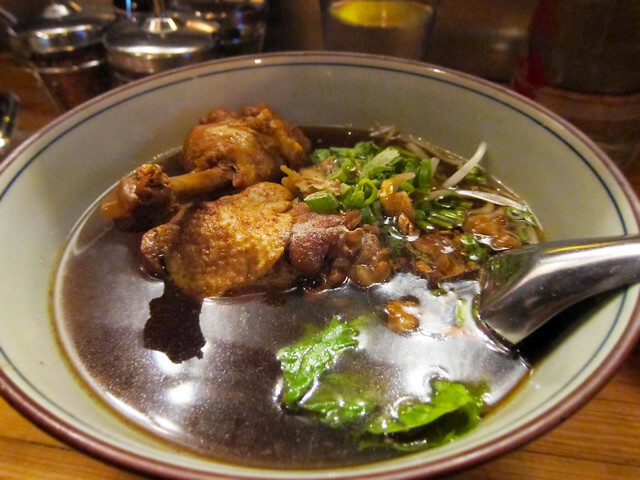 Two meaty chunks of bone on dark meat chicken provide body to the soup, and crunchy bean sprouts and escarole provide texture. 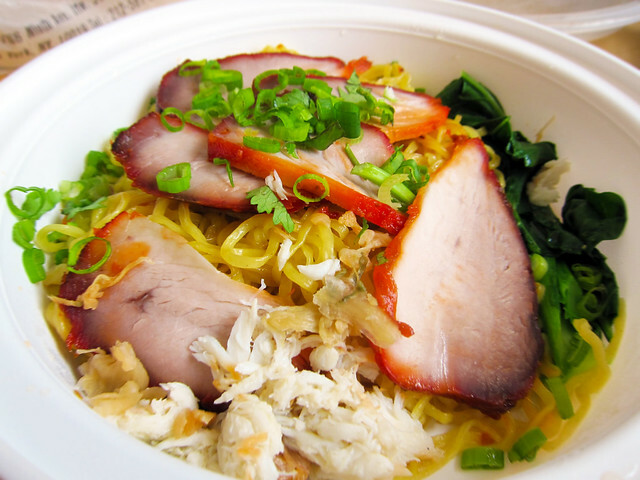 A measured portion of Ratchaburi crab and pork dry noodles ($7) is visually striking, pleasantly porky, and surprisingly refined for a bowl of noodles. Crunchy scallions and bitter yu choy work well with the fluffy sweet crab meat. However, my beloved egg noodles suffered mightily in transit (I took this lunch off-site), turning into a gluey clump of starch – I would recommend that this dish be consumed on-site, or a different noodle be substituted. 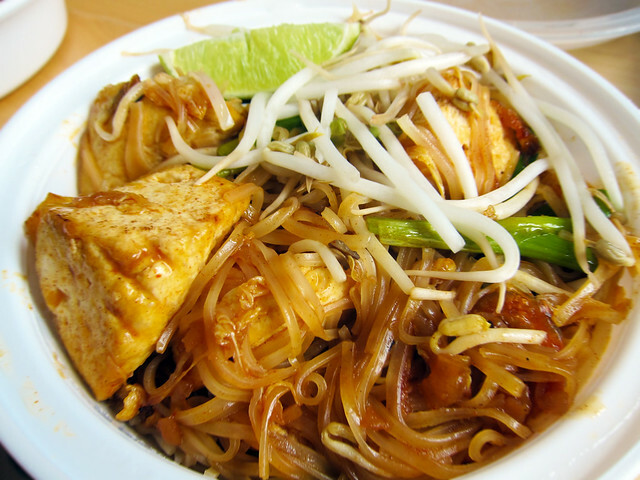 There’s pad thai ($6) to be had at Pure Thai, though it’s shuffled towards the rear of the menu as if an afterthought. I would encourage lunchers to stick with the more exotic fare and those dreamy egg noodles, but if pad thai must be consumed, then the version here is as good as any. Large swathes of puffy tofu with thoroughly juicy interiors replace the dried out nubs of tofu that most Thai restaurants get away with. And again, the flavoring strikes a delicate balance without being overwhelmed with fish sauce or tamarind. In keeping with their past successes at Land Thai and Recipe, the Pure Thai Shophouse team outperforms their peers on almost all measurable attributes, whether you’re judging the price, décor, service or flavors. And even though Pure Thai Shophouse is a newcomer to Hells Kitchen, the food is mature and focused, and certainly ambitious for the neighborhood. Reflecting on my past several meals here, I don’t think I ever want to eat at any other Thai restaurant on 9th avenue again. If that endorsement isn’t enough motivation to go out of bounds for a bowl of Thai noodle soup, then I don’t know what is. 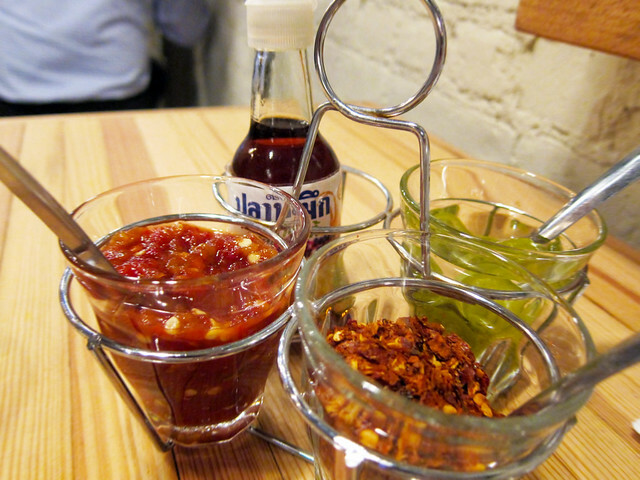 Posted by Chris H. at 11:45 am, November 1st, 2010 under Out of Bounds, Pure Thai Shophouse, Thai. wow, thanks, chris! i’ll be there! Anything resembling Khao Soi there ? I wish. I’m addicted to the khao soi at Rhong Tiam Express. I was hoping for something similar here. no shill here. 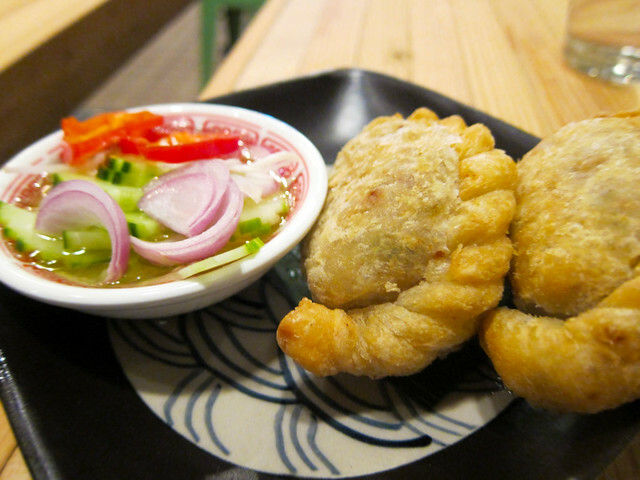 curry puffs needed a lot of work and the nakorn sawan chicken soup didn’t match the other dishes. I was very impressed with the food regardless. For the record, I live very close to this neighborhood and have suffered through countless Thai meals from the Wondee/Yum/Pam/Heng progeny – none of the food from these guys were as exciting as Pure Thai’s. I’m tired of Thai places (Q2, Room Service, etc) that try too hard with their decor to differentiate themselves. Pure Thai had super rustic/authentic decor, which I thought set them apart. Had the Pa-Yao Beef Noodle Soup with the Egg Noodles – beef was super tender and flavorful, the egg noodles had great texture, but the broth was really greasy. Also had the Wok Basil with Ground Chicken – good flavor, a tad too salty though. Also ordered the omelet with shallots – I love eggs fried in lots of oil and this side dish went well with both the noodle soup and the chicken. I shared all of the food, and for 2 small Asian women, it was very filling, and just out of ML price range with tax and tip at $11 each. OMG totally agree! I’ve been there 3 times in the past 5 days. pathetic, maybe. satisfying, definitely!! Just got back from Pure. I had the chicken satay and the jungle curry fried rice with mixed vegetables and tofu. Hubby had the wok chili turmeric with beef. It was amazing. So different even from Pam’s Real Thai (my previous reigning champ of Thai on ninth.) It tasted like haute cuisine – for $8. 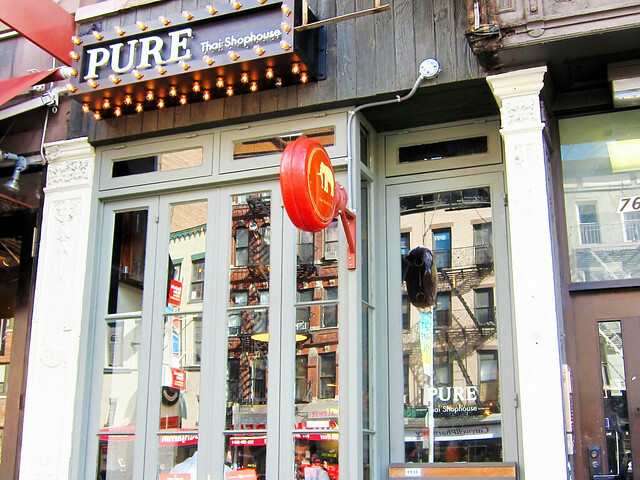 I too am loving Pure and have been there at least 1/2 a dozen times since they opened. But saying “i’ll suggest that Pure Thai Shophouse is perhaps the only Thai restaurant worth visiting on 9th ave” is too much to handle. Yes, there is a universe of mediocre Thai in 9AV, but Won Dee Siam 1 (792 9th Ave)is the mothership of authentic Thai in Manhattan. You can order things off menu like yen ta fo that are are as keeping it real as I’ve ever had out of Thailand. But don’t take my word for it – the staff from Pure eat at Won Dee Siam 1 (warning: do not confuse Won Dee Siam 1 with the other Won Dees). I did not enjoy any of the appetizers. Apparently the veggie dumplings are the thing to get and I will have to go back to give that a try. The pork rib was disgusting..it was hard and overcooked. The crepe thing was disgusting as well….the lime was too sour and even with those picked off it was bland. But the noodles…yes, they are good. Not Thailand good (I’ve been 5 times), but better than any other noodle shop in NY. I LOVE the fresh handmade noodles. That is hard to find in Thai restaurants. The place is way too small to be comfortable. I felt like I was sitting on the stranger next to me’s lap. And the men at the next table were talking so loudly, it was not fun. I think I would take to go next time. I agree with uptownnow…pretty much all Thais I know think Wondee is the best Thai, NOT Pam. Pam is good, but Wondee is better. And yes, they will make things off the menu for those who know what to ask for. That said, if you really want authentic Thai food…sorry..you gotta go to Queens! I also agree with uptownnow that Pure is NOT the only Thai place worth visiting on 9th. Wondee is excellent. Pam is great. I LOVEEEEEE Room Service. LOVE the food there. It is not authentic, but more fusion..but the food is awesome. 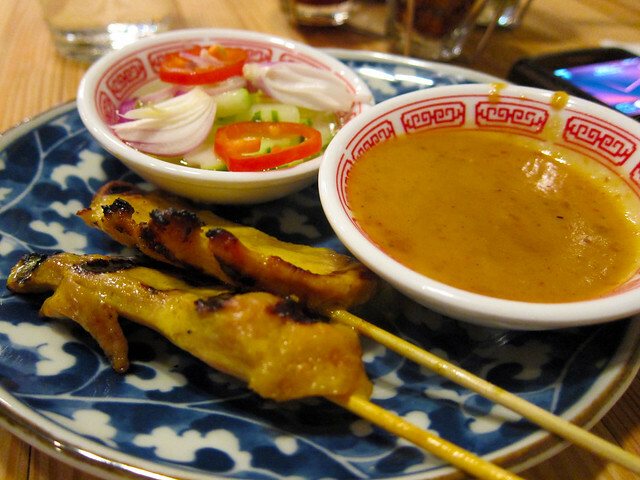 Off 9th, there are lots of other Thai places that are worth visiting. Reserve on 3rd ave springs to mind. 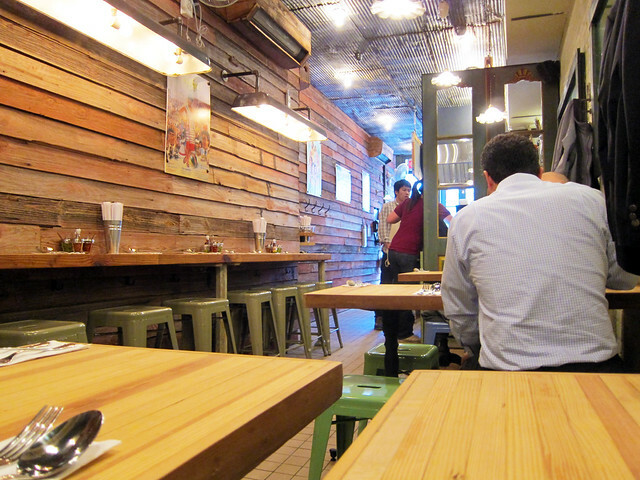 It is an unusual Thai tapas/wine bar that has very surprising, yet tasty “tapas”. Great writeup. I am droooling looking at these pictures. Nice job Chris! Just a heads up from someone who is Thai, this place is very far from being authentic. we had the curry calamari and this is not even close to how it is supposed to be made. the yen tah foh noodles was an absolute abomination. it is one of my favorite noodle dishes and I couldnt even eat it here. the water just plane tasted like vinegar and water. we also had the pad kee mao noodles which tasted ok, as long as you dont think it is authentic thai. I have been to Land, and now Pure because of all the hype and I think I will stay away from this chef’s restaurants. On a positive note though, the service was nice and the ambiance was something I enjoyed. This place is amazing. You cannot go wrong with the home-made noodles.